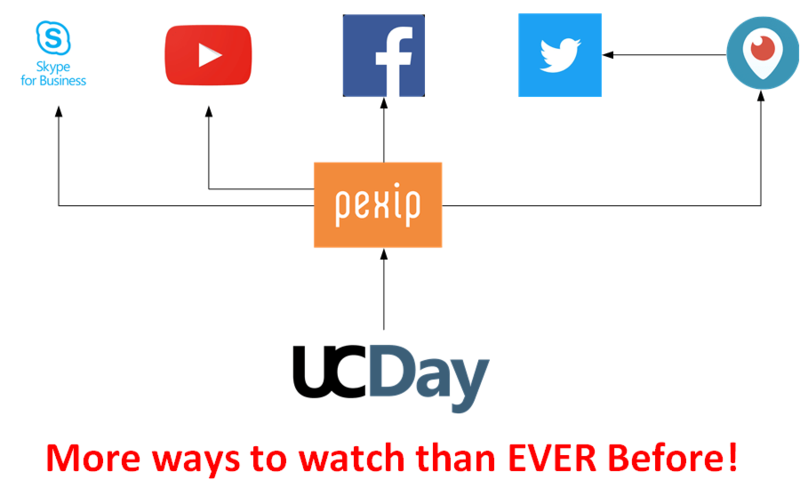 Many of you will know that I when I attended UC Day in 2016 as The Skype Show I broadcast a live stream to Skype Broadcast Meetings. This year I am being ambitious, not only in the schedule of live events coming to your eyes and ears, but also the platforms you will be able to watch the stream from! Our consumption of cloud services combined with our preference to use consumer over corporate services because generally they are more accessible, means that we must now adopt the B2C space first. Like Mobile and Cloud First methodologies, we should now be looking at B2C First. Therefore, with that in mind, I am very pleased to announce that in conjunction with one of my fabulous sponsors, Pexip I will be streaming to 5, yes FIVE online viewing platforms simultaneously! From my booth on the stage, using equipment purchased on a budget I am attempting to stream to Skype Broadcast Meetings, YouTube Live, Facebook Live, Periscope, Twitter (via Periscope), Three65.blog (via YouTube Live) giving you at least SIX different ways in which you can watch from the comfort of your own device, whether it is an iPhone, Android, Windows Phone, Laptop, Mac, iPad, even a Blackberry! and even to your Smart TV in your living room using YouTube App, or Cast! I am hoping that this accessibility will encourage viewership and raise awareness on how to leverage cloud services to reach out to your potential customer base and breaking that B2C barrier down with Thor’s hammer! First off the equipment. I have had to buy most of this stuff and have made full use of my Amazon Prime subscription! This year I want to have more than one person on at a time, so I am going all out and planning on having up to 3 guests at the same time. This poses a problem with audio, from last year’s experience and a single Blue Yeti Microphone just won’t do the trick, unless of course we all hug each other like a rugby scrum! So, I needed 4 individual microphones and herein the first issue, you can’t have 4 microphones in a Skype meeting from one device and having 4 laptops would just prove overkill and way, way too expensive. Taking some good advice from Max Sanna (@MaxSanna) who apparently moonlights as a music producer (Sann-i-am) I bought some basic vocal dynamic microphones and a audio mixer capable of mixing 4 pre-amp inputs from microphones into a USB output that I could then use in a Skype Meeting. I also want to use a better camera than last year, I had a problem with my Logitech C930e and LED lighting. When trying to record the camera was able to see the refresh rate of the LEDs so it produced flicker. So this year I am upgrading to a HD DV Camera. However, the output on this camera is HDMI, and Laptops only have an HDMI out, not in, so I needed a way of capturing the HDMI stream into an input. Luckily I have a Magewell HDMI to USB capture card, so this will do the trick for me. I am now able to connect the 4 microphones to SKype as a single device and also capture the HDMI stream from the DV Camera to a USB Virtual Webcam so this can be my video device in Skype too. Next I wanted to use my other webcam to look out to the sponsor hall to capture some scenes, so I can connect this to another laptop I have. However, this laptop serves another more important service. It will be the endpoint for the Skype Broadcast Meeting. 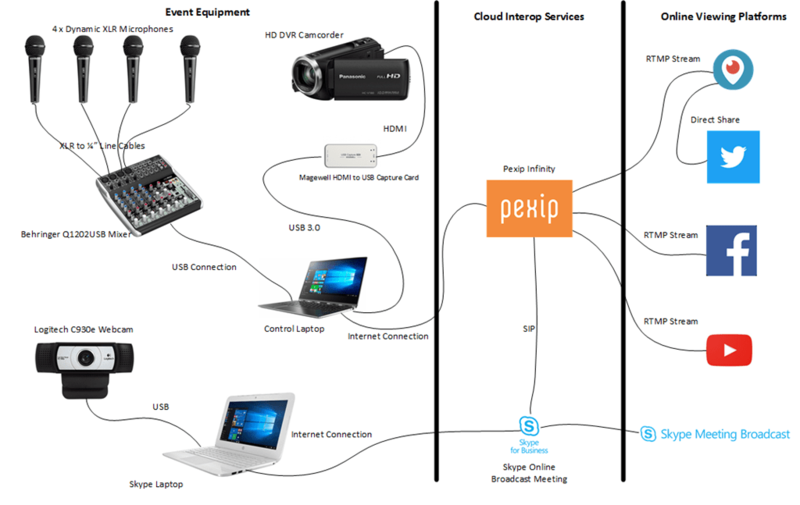 I haven’t found a way stream directly from Pexip cloud into a broadcast meeting because it lacks a dedicated endpoint and does not have an RTMP streaming service. So I have to schedule a broadcast meeting and join the broadcast from a Skype client. I can then invite my Pexip endpoint into the Skype broadcast meeting as an attendee and make the video active for broadcasting. The result is a 5 way multicast stream simultaneously to B2C and B2B services. Although, on the face of it, it seems rather complicated, it is in fact simple because Pexip makes it simple! The service is so easy to use, and when they say “It just Work’s” they really are not telling lies! All in all a pretty inexpensive rig. So don’t forget to sign up to UC Day today to get your free ticket to attend the conference in person at www.ucday.co.uk – See you there!